The idea that our offices will soon become paperless has been a dream for many of us for many years. The truth is we are far from a completely paperless office anytime soon. So the question becomes, “How can we manage all that paper?” Paper can overtake our office so much that it creates physical and mental clutter and clutter is an enemy of focus. With stacks of papers all around to distract you from the task at hand, it is nearly impossible to work at your optimal productivity level. Paper is challenging because it’s a tangible object that takes up space and multiplies at what feels like a constant speed, making it hard to keep up with. My top technique to conquer your paper flow involves two steps: first create a system for your paper and then maintain your paper system. 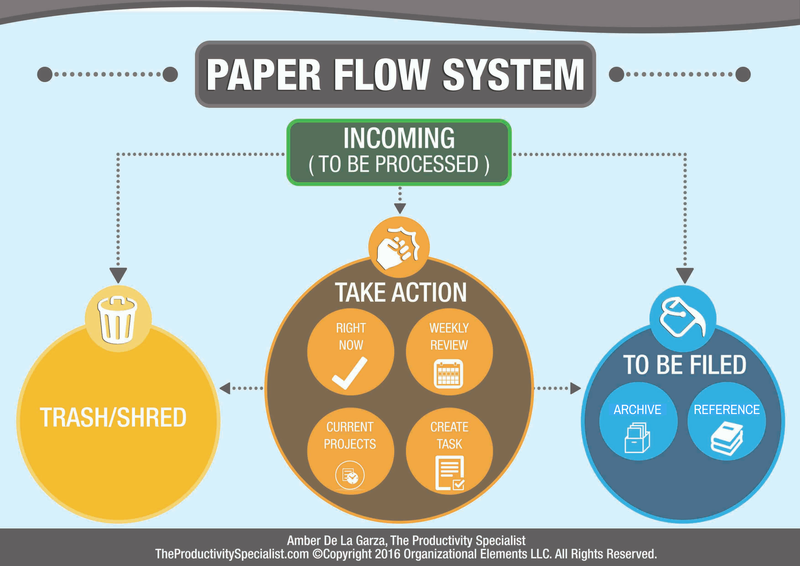 Creating a paper flow system involves designing a process for every paper that makes its way into your office. Paper is often overlooked as a priority because there are always more important tasks to accomplish than filing or organizing documents, but the truth is without the ability to find documents efficiently when they’re needed or focus on the task at hand, you are likely wasting even more valuable time. In fact, the National Association of Professional Organizers reports we spend an entire year of our lives looking for lost items! Creating and maintaining an efficient paper flow is an investment in constructing an environment that supports your productivity. Let’s start with your inbox. All incoming documents need to be processed. Processing paper as opposed to shuffling through papers requires you to make a decision as to what to do next with each paper. For most people this is where the paper flow generally stops and is the reason why documents pile up on your desk or shelf. Immediately choose which category each paper falls into between Trash/Shred, To Be Filed, or Take Action. This category is the easiest to maintain. If you do not need to take action on a paper and will never need to reference it again, shred it if it contains personal information or trash it if it does not. Place a shredder or box for shredding and trash can in a spot where it is easily accessible from your desk. This will enable you to simply and quickly shred or trash unneeded documents. If you in fact might need or will definitely need to reference a paper at some point in time but it does not require immediate action, drop it in a To Be Filed Each week or month when you are alerted to complete your filing (you will have scheduled a re-occurring task), go through the box and file away each paper as either an Archive or Reference document. Archive – File papers that you most likely will not need to reference in the future as Keep them conveniently organized in files in a chosen location far from your desk. e.g., Save seven years of tax documents in your Archives just in case you are audited. Reference – File papers you likely will need to reference close to you for quick filing and easy access. Keeping them within an arm’s reach of seating or standing at your desk is best. e.g., Save industry resource materials in your Reference files so you can access them quickly as they’re needed. If a paper requires you to take action on it, whether it is a bill that needs to be paid, a project that needs to be worked on, or a phone call that needs to be made, consider it a Take Action paper which will fall into one of four categories: Right Now, Create Task, Current Projects, or Weekly Review. Right Now – If the paper requires your immediate attention, complete whatever action it requires right now. A good rule of thumb is to do it right away if it takes less than four minutes. Send the email, make the call, mail the letter, or find the reference document. Whatever the document is, take action on it right away. After you have completed the task, decide whether you need to Trash/Shred or drop the paper in your To Be Filed Do not let the paper become additional clutter. e.g., Return a call or email to schedule a meeting. Weekly Review – If you do not have time to create a task or are unsure what next step should be taken upon looking at a paper, consider it a document for your weekly review. This works only if you know that no action needs to be taken prior to your weekly review. Keep these papers in a convenient organizational holder somewhere in your office other than on your desk. If they were on your desk, they might distract you from tasks that do need your attention before week’s end. When you go to perform your review at the end of the week, you will address all of these papers at once and decide how to take action on them then. Once you have taken action on each paper during your weekly review and completed each task, decide whether you need to Trash/Shred or File the paper and do so. No matter how efficient the paper flow system you create is, if you don’t maintain it, you will likely find yourself on an organizing yo-yo diet consisting of cleaning everything up just to let the papers stack back up over and over again. The key to long-term success is to commit to system maintenance. Utilize the following eight recommendations to consistently maintain your paper flow system. Don’t Shuffle Paper – If you shuffle through your papers while attempting to sort them you are just avoiding making a decision as to what to do with each document. Touch each paper once and make a decision. Quickly Make Decisions – It’s only paper! Often times we freeze and refrain from taking action because we fear making the wrong decision. If the decision is too difficult to make quickly, postpone it by making the paper a weekly review document and come back to it then when you have the time to better assess it. Don’t Over-Organize – Filing documents into folders is for the sole purpose of retrieving them quickly when and if they’re needed. Creating so many folders that each one only has one or even a few papers in it only complicates the filing and retrieval process. Organize sensibly. Trust Your Instinct – When you originally touch each paper, what is your first thought? Does a certain word come to mind? For example, if I pick up my automobile purchase contract, do I first think Auto, Car, or Dodge Charger? When you go to retrieve that document or file a similar document away again, you will theoretically think of that word then too. You could create one file for Automobile if you have one car or a different file for each of your vehicles if you have several, labeling them according to their make and model. Do whatever works for you. When was the last time I needed this type of document? If I needed this document again could I get a copy somewhere else? Do I need to be the person to keep this document? Would there be any consequences if I don’t keep it? Mark Purge Dates – On each folder you file away as an Archive, write the date when its contents can be purged. Perhaps you need to keep bank statements for seven years. Write whatever date it will be in seven years on the folder so you can Trash/Shred those documents without hesitation when you do your annual purge seven years from now. Every Document Needs A Home – Whether it is a file folder, drawer, box, binder, magazine holder, or wire step organizational rack, every single paper in your office needs a home and your desk does not qualify. Create homes for every type of paper that could make its way into your office and get in the habit of putting each and every one where it belongs instead of letting them pile up and create clutter. Utilize Single-Tab Folders – Do not complicate your filing system by using multiple-tab file folders. At first glance, using three-tab or five-tab folders might make sense because their design increases visibility of each folder. However, when you add or remove folders from your files, the multiple tabs no longer make sense and folders consequentially wind up hiding behind each other. Instead, use only single-tab folders such as center position folders for your entire filing system. It makes sorting through and accessing documents more simple and maintaining organized files easier. Creating a sound paper flow system may take some trial and error on your part. After all, you may have gotten in the habit of letting stacks of papers build up on your desk and habits, especially those due to lack of action, are hard to break. The benefits will be well worth the effort, however, as you decrease your paper clutter and increase your ability to stay focused and find needed documents with ease. Studies show that some executives will pick up a single piece of paper from their desk thirty or forty times before acting on it, (Michael F. Woolery, Seize the Day). Don’t let such bad habits hold you back from working at your maximum productivity level and achieving more in your business. Commit to create a paper flow system for your office.